Specially-Priced Tickets - Tourist Information | TOYAMA CHIHOU TETSUDOU INC.
We provide a number of tickets for different customer needs, including coupon-inclusive tickets and hop-on hop-off tickets for the Toyama Chihou Railway lines and tram lines. Bargain-priced, hop-on hop-off tickets for one day of travel by railway or tram. Recommended for those traveling to the Tateyama Kurobe Alpine Route, Kurobe Gorge, or places inside the city of Toyama. Toyama Chitetsu Ticket Center, Dentetsu-Toyama Sta, Shin-Kurobe Station, Unazuki-Onsen Station, Tateyama Station, etc. Bargain-priced, hop-on hop-off tickets for two days of travel by railway or tram. Recommended for those traveling to the Tateyama Kurobe Alpine Route, Kurobe Gorge, or places inside the city of Toyama. 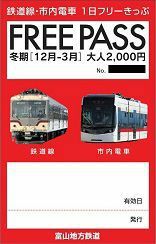 A highly economical ticket that allows one day of hop-on hop-off tram travel and includes three coupons which can be exchanged for Toyama specialties, such a sweets or a slice (1/8th) of pressed trout sushi Take the tram and enjoy all the fun and beauty that the city of Toyama has to offer. Toyama Chitetsu Ticket Center and Dentetsu-Toyama Sta. A one-day hop-on hop-off ticket usable for trams, the Toyama Light Rail, and buses (servicing ¥280 route segments from in front of Toyama Station). 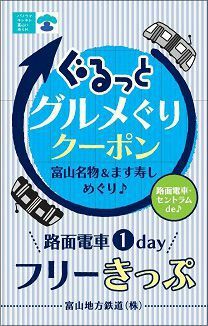 Recommended for visiting places in Iwase or downtown Toyama. Toyama Chitetsu Ticket Center, Toyama Chitetsu Nishicho Ticket Center, Toyama International Conference Center, Portram Shop Toyama-eki-kita, etc.